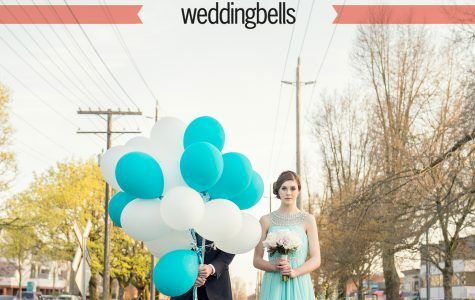 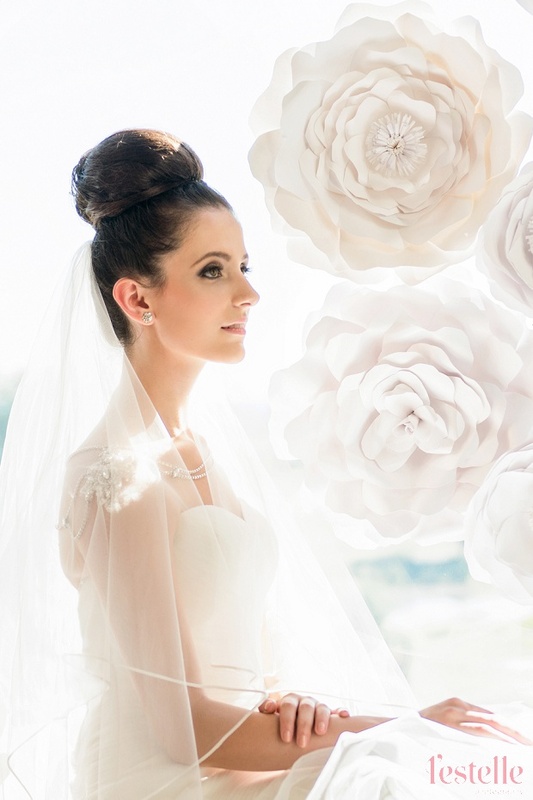 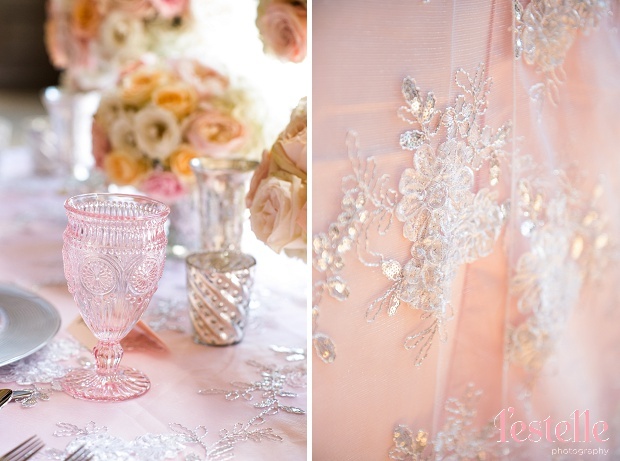 This beautiful session is a spring wedding fantasy planned by D’Love Affair! 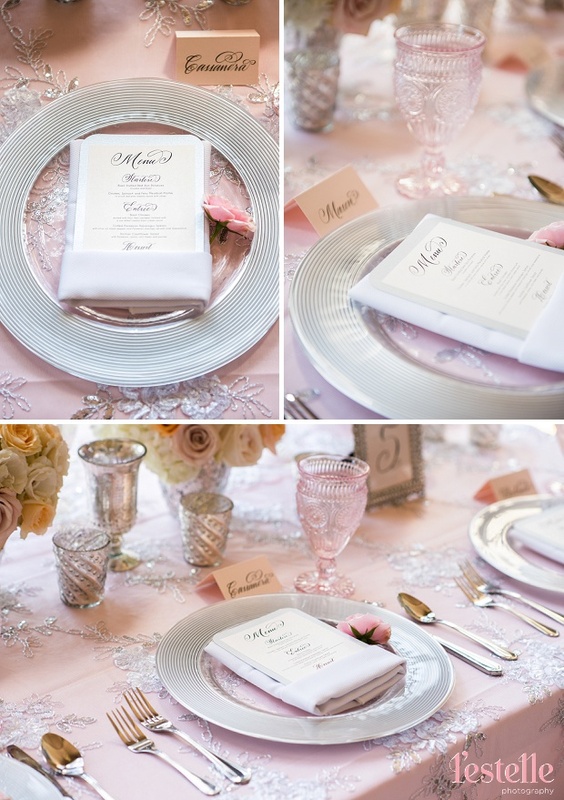 The vision was to create a romantic and elegant styled shoot with a swoon-worthy color palette of peach, blush pink, cream and silver. 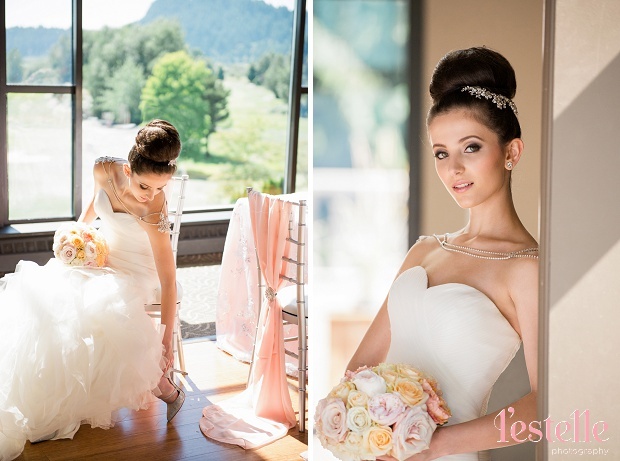 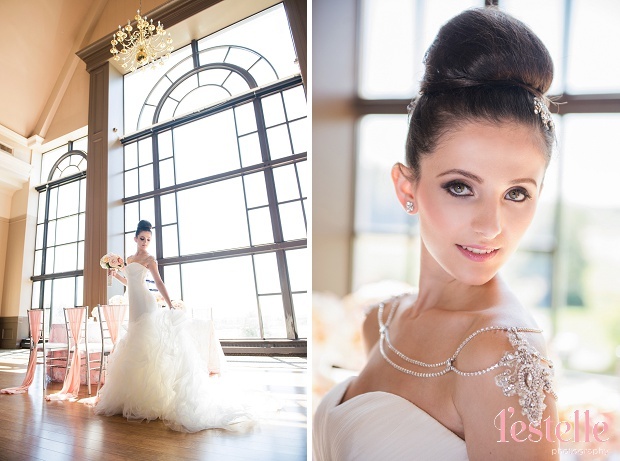 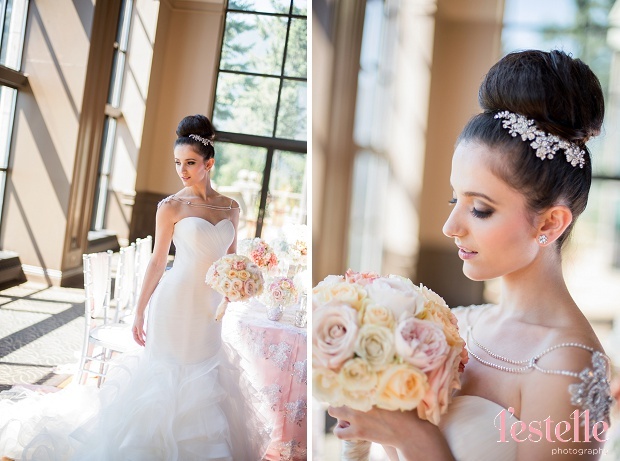 The Grand Ballroom at the Swan-e-Set Resort & Country Club was the perfect backdrop for this editorial shoot. 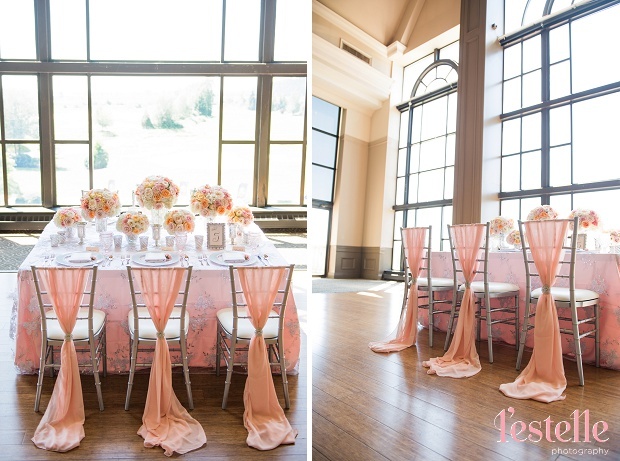 The floor to ceiling windows and stunning chandeliers teamed with the soft peach and cream hues create a feeling of timeless elegance. 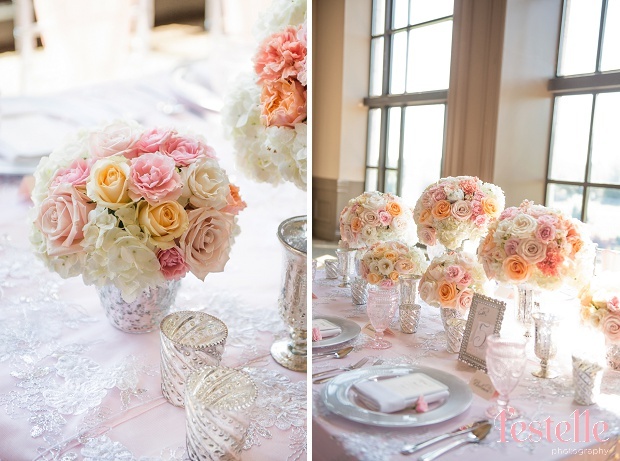 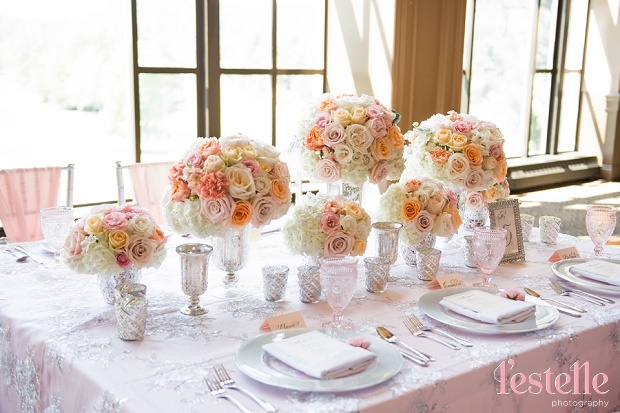 The beautiful tablescape, styled by Infinity Luxury Linens and Decor, featured a blush satin linen with vintage lace overlay, topped with multiple floral arrangements in mercury silver glass vases. 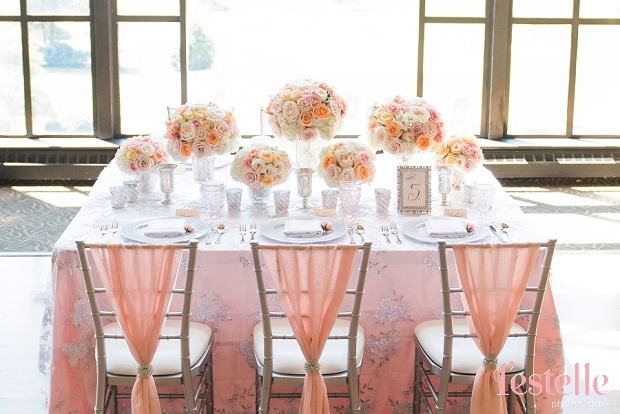 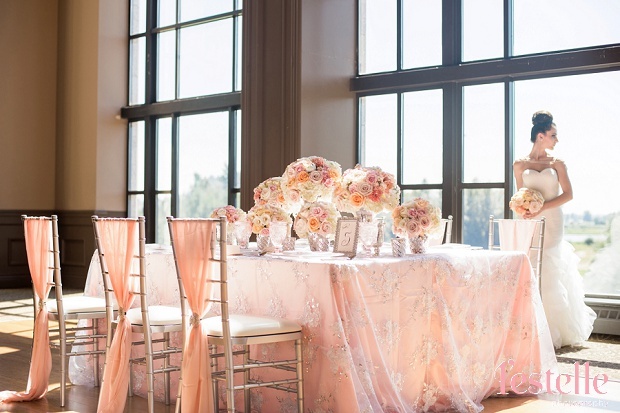 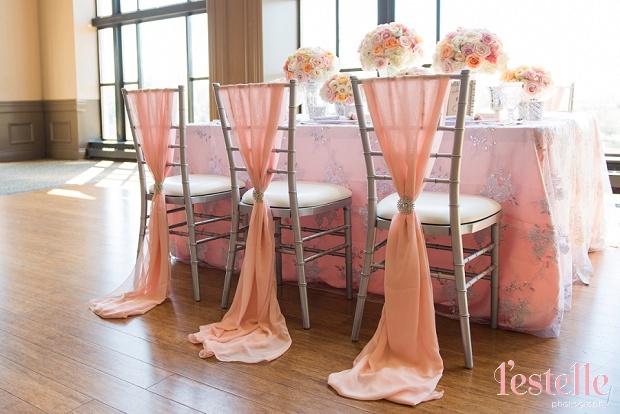 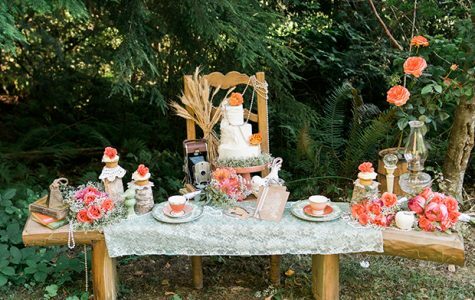 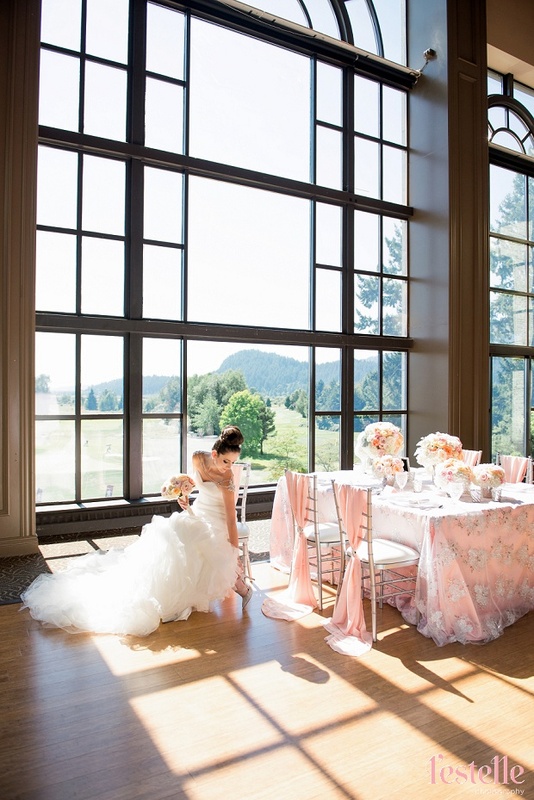 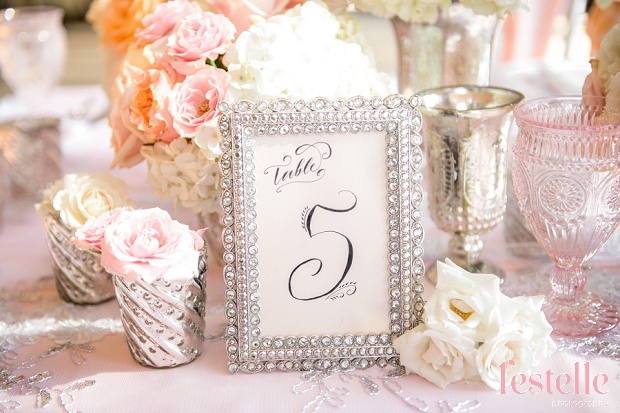 Matching blush chiffon chair sashes were used to add a whimsical vibe. 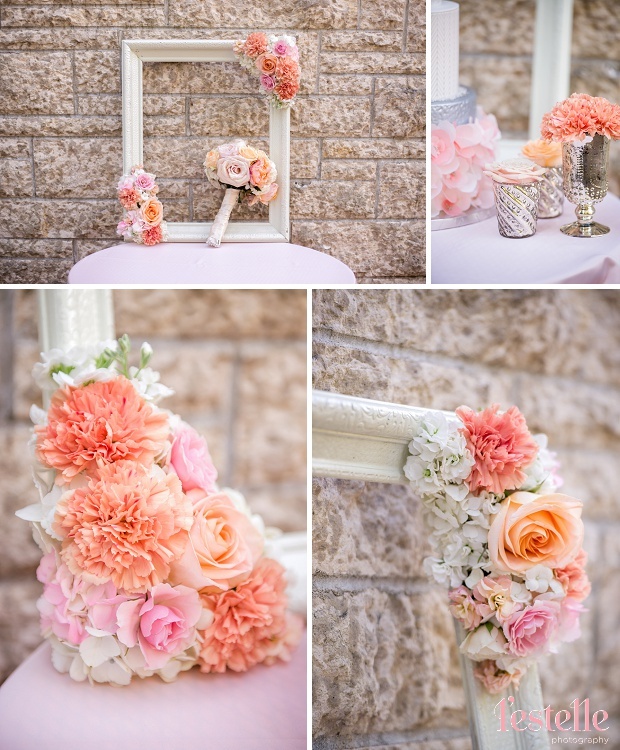 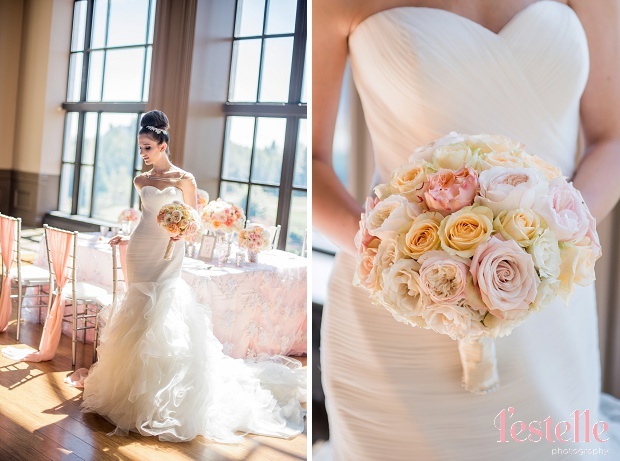 With the romantic theme, the floral designer, Esu Floral, used a mix of different roses in soft pink, peach and blush, to complete the overall look. 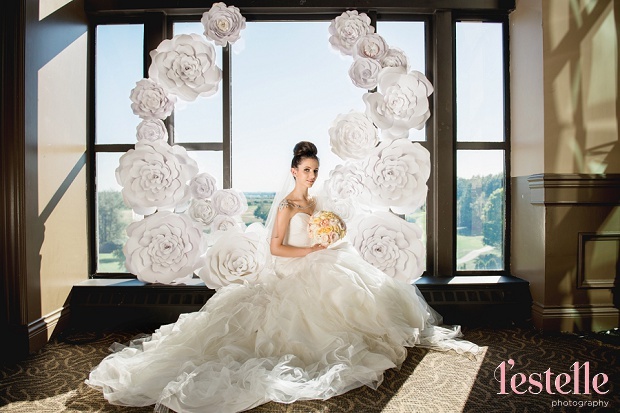 To further create an angelic feel to this session, individual paper flowers from Making Memories with Scrapbooking were used on the windows, to create the whimsical effect. 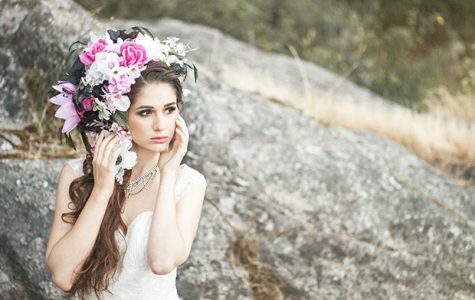 To create a glamorous and elegant look for the model, ACmakeup had chosen a timeless look that compliment with the body jewelry and hairpiece styled by The Borrowed Collection. 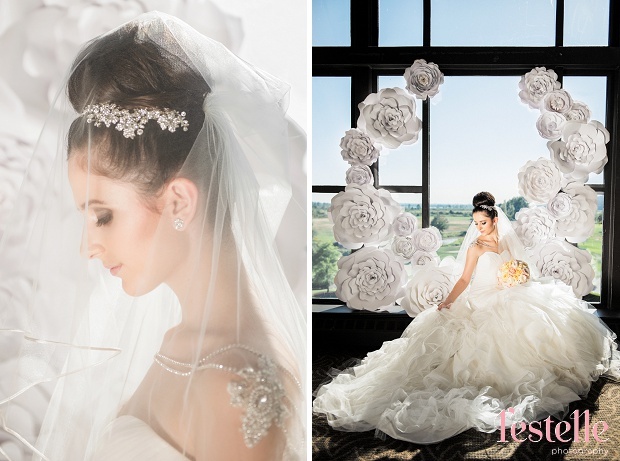 The model wore a gorgeous Pronovias “Mildred” dress from Clara Couture – an original dress in draped tulle with a sweetheart neckline, tulle frills and nylon ribbons. 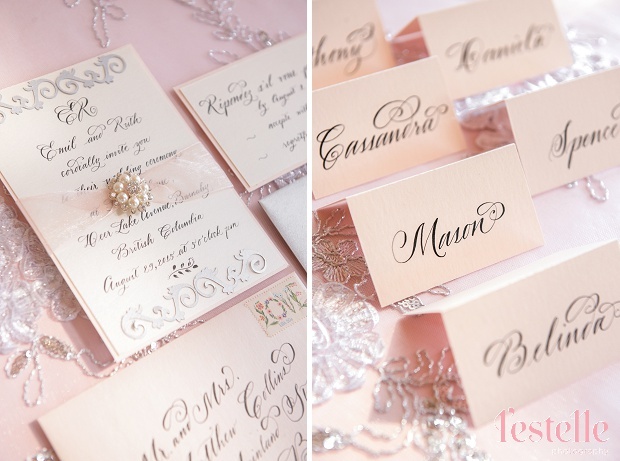 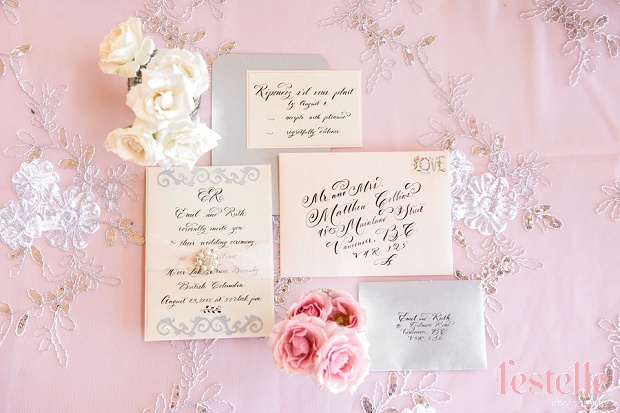 With the use of a clean calligraphy style script and other subtle details, Maurelle Calligraphy created a custom stationary set that complimented the tablescape perfectly. 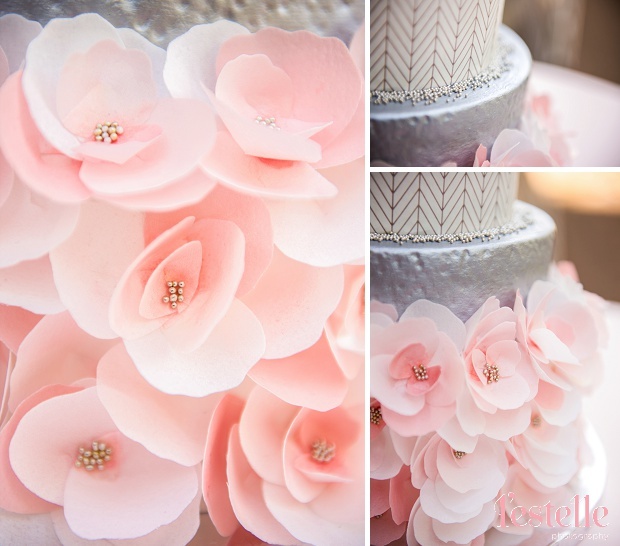 Kitty Wong Pastry Shop crafted a stunning three-tier cake with delicate blush-toned rice paper flowers. 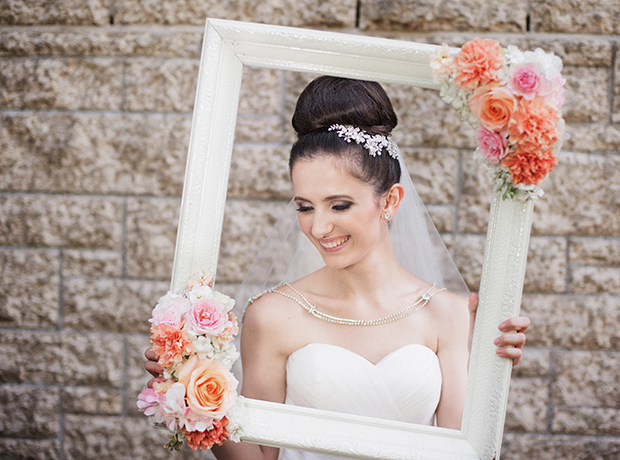 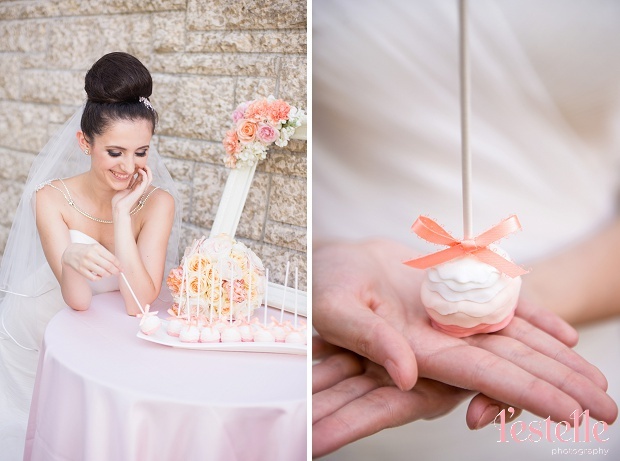 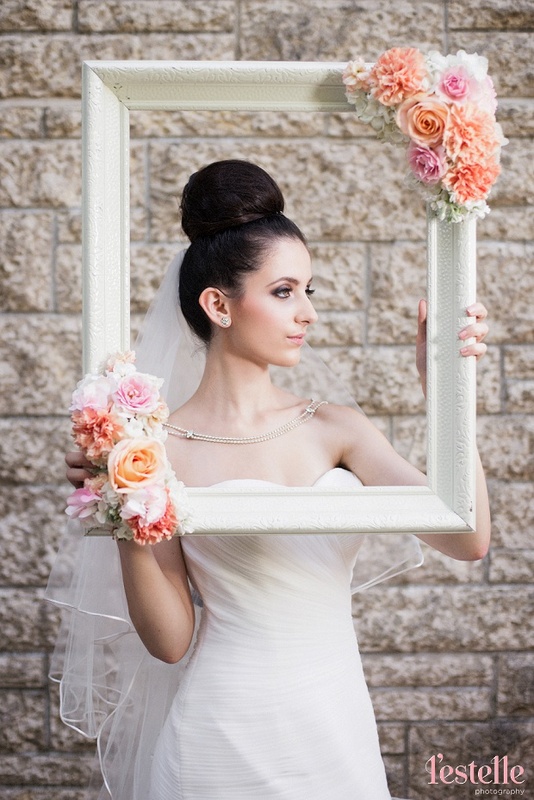 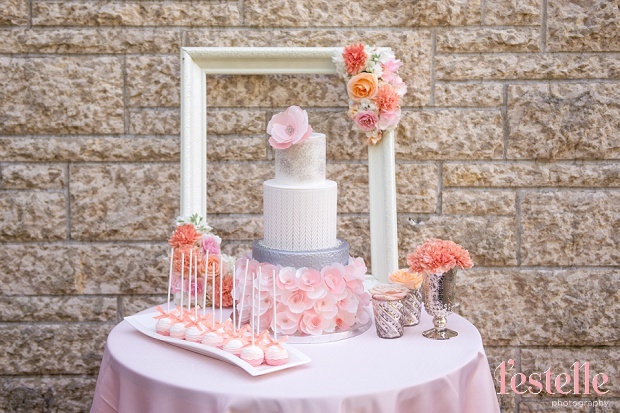 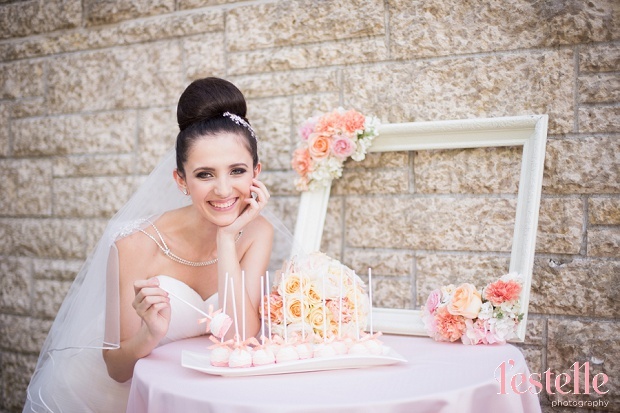 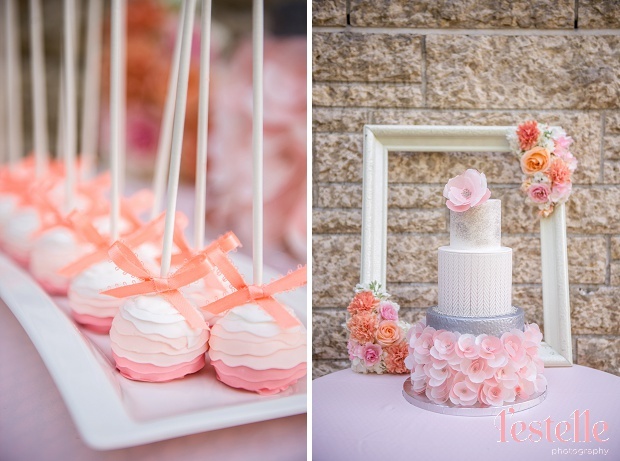 The peach ombre ruffled cake pops along with the beautiful floral frame add a unique touch to the theme.